Game over: Can Jonny shake off his Amlin Challenge Cup disappointment in time for Top 14 play-offs? IN FRANCE they call them ‘les barrages’, in English we’d call them ‘play-offs’; perhaps the best description is the Top 14 quarter-finals, which is in effect what unfolds on Saturday when Castres host Montpellier and Racing Metro visit Toulon, writes Gavin Mortimer. At stake is a semi-final place the following weekend with the winner of the first tie facing Toulouse and either Racing or Toulon taking on Clermont. Daunting prospects, both, particularly for Toulon following last week’s horror show in the final of the Amlin Challenge Cup. Somehow Toulon have got to get themselves back up after slumping to a miserable defeat to Biarritz in a match that was a shocking advertisement for the game of rugby. What followed 24 hours later at Twickenham put French rugby firmly in its place as two Irish sides produced a performance that was light years ahead in pace, power and perception. 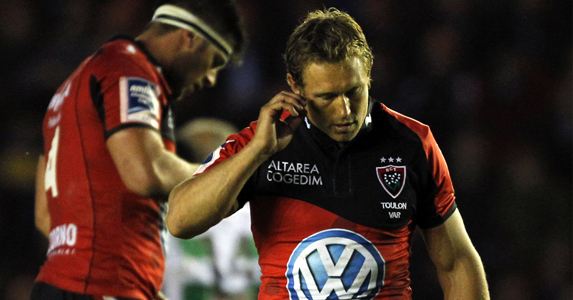 Almost heretically (for such is his standing in France), Midi Olympique took Jonny Wilkinson to task for his failure to drag Toulon out of their malaise last Friday evening. Wilkinson’s inability to produce a plan ‘B’ mid-match when his side was struggling was a criticism levelled of him during the latter stages of his England career, when he had neither Mike Catt nor Will Greenwood in the centre to offer their advice. According to Midi Olympique Wilkinson is looking tired, mentally and physically, after a season that started with England’s World Cup warm-matches last August. “Will ‘Wilko’ be able to rediscover his best form against Racing-Metro?” wonders the paper. We’ll find out on Saturday evening. The other ‘barrage’ offers Castres’ Romain Teulet the chance for redemption against Montpellier. The two sides met at the same stage last season and Teulet had a shocker, missing a series of kickable penalties – including an easy shot at goal on 78 minutes – to hand the match to Montpellier. Montpellier, for their part, will be hoping to surf the wave that has swept through the Mediterranean City following their football club’s success. Last Sunday Montpellier – operating on a shoestring budget in comparison to the likes of PSG and Marseille – won the French First Division title for the first time in their history. It was a remarkable achievement and one the city’s rugby club will look to continue on Saturday.